Its Tuesday again, and that means its time for yet another Tuesday with Dorie post! Out of all the cookbooks that I own, that is without a doubt, hands down, my most used one and its thanks, in no small part, to the efforts of this group. This week, the chosen recipe is Fresh Ginger and Chocolate Gingerbread. Like so many recipes that I get to make as part of the TWD group, this is probably one that I wouldn't have chosen on my own. Yet, many times after making these recipes, I come to realize what I would have missed out on. This was another one of those. 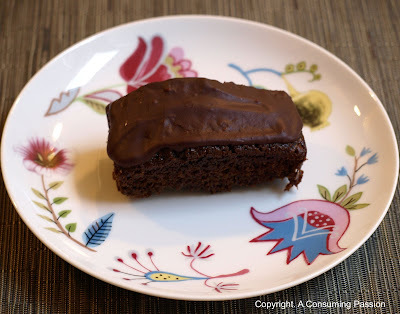 The chocolate and ginger combination worked really well here, with the sweetness of the chocolate icing helping to tone down the tang of the ginger. I did, however, choose to leave out the crystallized stem ginger as I was afraid it would be too "gingery". I didn't miss it, but fans of ginger may want to throw them in for that added kick! Cute loaf and even cuter plate! I, too, never would have chosen this myself, but I am glad this was chosen for me! It was fantastic! Yours looks great! I toned down a lot of the spice. I love the plate your g'bread is on! I didn't use fresh ginger, but loved the cake anyway...it was really good! Nice job!!!! This was so easy I had to make it, even with 1/2 a kitchen!! Very nice loaf!! I really loved this cake, and yours looks fabulous! Your gingerbread looks wonderful. I loved this recipe, it was so good. Felt the same way about the recipe. Wouldn't have made it but really liked it. Chocolate and Ginger works for me. I almost used this before when I wanted Gingerbread. Glad I waited. Mine is baking and smells wonderful. Nice job on yours. I'd like to echo others comments about the plates! They are super cute. I love the cute little loaf you used! I also left out some of the ginger. Your cake looks wonderful, good job! This was something I normally would not have chosen to make either. I actually debated as to if I wanted to make it or not. Glad I did. It turned out to be a hit in the office. i agree, i wouldn't have made this myself but we ended up loving it which is usually the case on the ones i'm so-so on. I wouldn't have made this either if it weren't for the TWD group. Yours looks wonderfully moist and chocolatey! Lovely cake. I really liked all the ginger flavor.